Arnott and Vederoff Ancestors - William S. Arnott with Lynell Joyce Arnott (left) and Cassandra Arnott. Photo taken at his home in March, 1999. 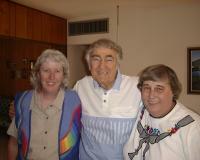 William S. Arnott with Lynell Joyce Arnott (left) and Cassandra Arnott. Photo taken at his home in March, 1999.